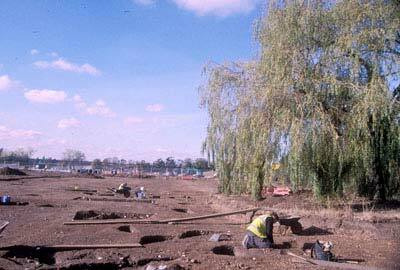 The remains of a significant Iron Age hill village, which dates back to around 800BC, were revealed when, prior to the building of Fairfield Park, excavations were carried out by Oxford Archaeology. 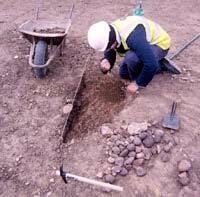 The dig was carried out on behalf of Fairfield Re-developments Limited. The archaeological site gradually emerged as the staged residential development of the 27.6-hectare estate got underway. Trial trenching of the site in the mid 1990s had suggested the presence of a Roman settlement, so it was quite a surprise to reveal a substantial site of greater antiquity. The investigations began in October 2002 and were completed thirteen months later, by which time Oxford Archaeology had excavated almost 3 hectares of the estate, revealing extensive and dense remains of the ancient village. Throughout the excavated areas were found the diverse echoes of early Iron Age life, the by-products of a great many generations of occupation. Largely, the remains reflect the more material aspects of life such as roundhouses and post-built sheds, storage pits, animal pens and plots of land that were separated by ditches and hedges. The finds too reveal the diversity of domestic life – cooking, hunting, food processing, textile production, and animal husbandry (see photographs of finds below). But this period of ancient Britain still holds many mysteries for the archaeologist and not all features at Fairfield could be ascribed to practical purposes. What of the curious alignment of pits that appeared to weave between houses? They are remarkably similar in dimension and at fairly regularly spaced intervals; too wide for post-settings, too shallow for storage. Some of these were clay-lined. Two were found to contain skeletons of young children, almost foetal in posture. A hint of ritual behaviour, perhaps? Over the last two decades, archaeologists have been very sceptical of the use of ‘ritual’ as a means of understanding features and deposits that cannot be explained in earthly or practical terms, and certainly there appears to have been an ’overkill’ in the use of the word. Archaeologists, however, are increasingly noting artefacts or bones that have been deliberately and selectively placed within certain dug features. Such discoveries, referred to as ‘structured’ deposits, are believed to have been associated with long forgotten beliefs. With Oxford Archaeology’s team constantly alert to the recognition of these special finds the settlement at Fairfield Park proved to be no exception. Significantly, amongst these structured deposits were the fragments of five rotary querns, originally used to grind corn, which were positioned in the middle of the entranceway to a round house. ‘Deliberate placement‘ seems a careful alternative to ‘ritual’, but nevertheless such occurrences deserve explanation. Indeed, the interest in the deliberate deposition of material culture has been steadily growing over the last decade, although the study of how rotary querns fit into this pattern is relatively under-developed. The discovery of rotary quern fragments from closely dated early to middle Iron Age contexts in Britain is also highly unusual; the Fairfield querns are believed to date from the 4th century BC. The rotary quern is generally believed to have been introduced to Britain during the middle Iron Age but the transition from saddle to rotary querns was lengthy and the changeover varied regionally. Other finds included a large assemblage of rather uncommon decorated pottery, occasional items of jewellery, and a large quantity of weaving implements. rounded by a double ditch and rampart. 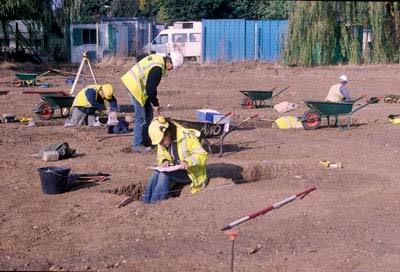 Oxford Archaeology’s excavations were situated north and south of the old hospital complex and it is presumed that the Iron Age settlement extended across the entire site. If this was indeed the case then the village may have had upwards of 40 roundhouses at any one time – perhaps the base for a group of extended families, or a clan, forming a substantial element of the regional tribal community. Computer experts at Oxford Archaeology plan to use the excavation evidence to reconstruct the appearance of the Iron Age village. Once the analysis of the finds is complete, the artefacts will be placed in Bedford Museum. “Although it was part of the planning agreement to enable this archaeological survey, we are delighted that it has produced such a fascinating conclusion. It simply adds to the historical story of the land,” said Fairfield Re-developments Ltd Project Director Peter Sutton. The new development, one of the largest in the area, will also provide a new school and a range of community facilities, including the conversion of the former Victorian hospital into exclusive apartments. Some of the finds from Fairfield Park are pictured below. These are in order (left to right) an Archers’ wrist guard, Bone spindle whorl, Bone ring, Jet finger ring, Decorative potters’ stamp. Fragment of quern stone used for grinding corn. Decorated Iron Age pot rim and a Sheep bone with wear marks indicating use for weaving.